This insurance provides cover against loss or damage from fire, lightning, explosion (of domestic boilers), and other related perils. 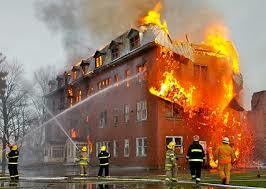 Loss of or damage to insured property by any cause other than those specifically excluded in the policy. This policy provides cover against loss of profit due to reduction in turnover and increase in cost of working (increase in cost of working is additional expenditure necessarily and reasonably incurred for the sole purpose of avoiding or diminishing the reduction in Turnover, which, but for that expenditure, would have taken place during the Indemnity Period in consequence of the Damage) as a result of Interruption of or interference with business carried on by the insured at the premises following loss/destruction or damage covered under the fire policy to the property used by the insured. Provides cover to computers/accessories and other electronic equipment against any unforeseen and sudden physical loss or damage from any cause other than those specifically excluded.